Conrad has received a lot of grief as an imperialist, Eurocentric writer who treated the peoples of the rest of the world as a lot of savages. I think this beef is largely wrong, often drastically wrong, even though no writer is above criticism. My advice is that everyone read him and then debate him—because he's really worth reading. Conrad shares many of the characteristics of great writers. He thinks deeply about the human condition, and probes human nature under often extreme circumstances. He can inhabit radically different characters, making them fully alive on the page (many of those characters being non-Europeans). He creates rich, believable worlds. As he once wrote, his goal was, above all, to make you see. In our visual age, that capacity for cinematic imagination should be appreciated more than ever. In Nostromo, Conrad tells a tale of high politics, family struggle, and intense drama, set in a fictional South American country. He brilliantly depicts radically different perspectives on fast-moving events—from the old Italian revolutionary to the Englishman who shakes up the country by opening a lucrative silver mine, from a brutal dictator to a San Francisco financier to the heroic stevedore whose name provides the title. 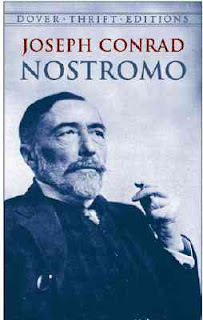 I came to see my book, though nonfiction, as following the pattern set by Nostromo, an epic tale of business, politics, war, and adventures at sea, populated by an enormous range of characters, each with his or her own agenda and impulses. I didn't try to mimic Conrad, of course, but I wanted to capture some of the qualities that make Nostromo such a treat for me. After all, they say that writers ultimately write their books for themselves. If they didn't, then writing would seem like working for a living.